For years, I've been fascinated with home cooking, especially baking, in the first half of the 20th century, the time right before "convenience" foods became commonplace. I have a collection of cookbooks from back then, with titles like Bettina's Best Salads and What to Serve with Them (by the same authors that brought us A Thousand Ways to Please a Husband) published in 1923, and When Mother Let Us Cook, a 1919 book with the explanatory subtitle: A book of simple receipts for little folk with important cooking rules in rhyme together. But even more compelling than these beautifully illustrated books, are the hinged metal recipe boxes and scrapbooks filled with carefully typed or handwritten recipes that I've collected through the years, mostly purchased for a dollar or two at estate sales or yard sales. These recipes are the real treasures, and probably more accurately reflect what people cooked and ate back then. I love the names of the recipes -- moonlight chocolate cake, lovelight lemon cake, and the annotations on the recipes themselves -- DOUGHNUTS: Aunt Becky's From Mothers Recipe, or the word "good" written boldly at the bottom of a recipe for fudge. 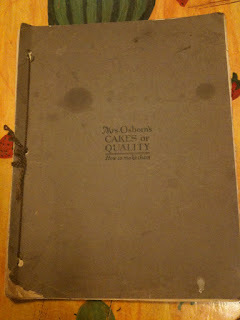 Another favorite is an apparently self-published "book" from 1919, Mrs. Osborn's CAKES of QUALITY: How to make them, which I bought a dozen years ago at a roadside flea market in the Adirondacks. 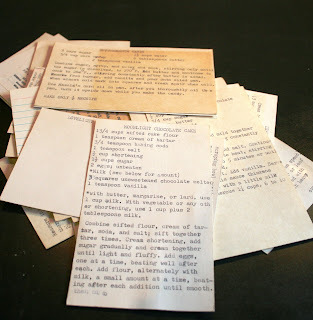 The first half of the book -- loose typed sheets of parchment-like paper bound within cardboard covers by a piece of string -- is a collection of recipes (sweet and savory) from various women (perhaps neighbors). In the second half, Mrs. Osborn of Bay City Michigan, instructs women on how to bake cakes for their families, and how to sell cakes for profit. Anyway, the point of all of this is for the next 12 months, I plan to cook and bake my way through many of these recipes, at least one a week and hopefully more. These are untested recipes -- many just a list of ingredients with little or no instruction or measurements calling for "a handful," or "butter the size of a walnut" so I expect to have lots of culinary adventures. I invite you all to join me as I cook my way back in time. way to go susan. great that you got your new blog up and running. i look forward to following your exploits!! Susan: Congrats on this new venture. Consider my office your "taste" kitchen! Sue what a great idea.... have fun and happy eating. This is so exciting. I will be an avid reader.Already I'm so intrigued by the adding of the butter to the dry ingred. Jim and I would like to help taste test your endeavors! Such a great, unique idea! @Everyone: Finally responding, 18 months later! Thanks to all of you, my faithful readers. It's a fun ride and not over yet. I found your blog a couple of days ago and I just have to start from the beginning. I'm a collectors of cookbooks from the 40s and 50s. Can't wait to read your whole blog!